Syria's state media claims that US-led coalition forces attacked positions held by Assad regime in Syria, causing casualties. The American-led coalition working to combat the ISIS terrorist organization struck positions held by the Assad regime in Syria over the weekend, Syrian state media claimed. Citing Syrian military sources, the Syrian SANA media outlet said Sunday that coalition forces struck regime forces in eastern Syria late Saturday night, inflicting casualties on the Syrian forces. “U.S. coalition aircraft launched an aggression this evening against one of the Syrian Arab army formations operating in the Albukamal area in the southeastern countryside of Deir al-Zor,” SANA reported, citing an unnamed military source. 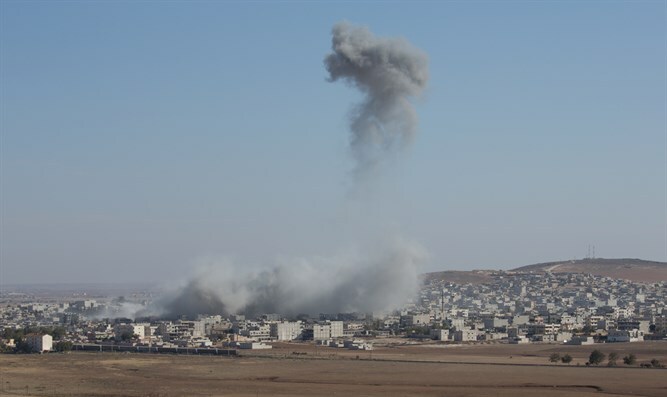 According to SANA, the allied coalition attack on the Syrian forces left two Assad regime soldiers injured. In addition, an artillery piece was destroyed. An American military official who serves as spokesperson for the campaign in Syria, Operation Inherent Resolve, confirmed that allied forces opened fire on Syrian troops, but said they had done so only after being attacked. “Our partner forces were fired upon and exercised their inherent right to self-defense,” Colonel Sean Ryan told Reuters.